The Center receives no public or university funding. The Center has supported itself through olive product sales, research grants, fee-based services, educational events and donations. The Olive Center relies heavily on graduate students to conduct boundary-pushing research on olive production, processing or evaluation. We carefully select graduates with high academic standing, a strong work ethic, and a commitment to pursuing innovation. $25,000 would fund a half-time graduate student for one year, while $50,000 would fund a full-time graduate student for one year, with the required university fees included. Special recognition in fellowship research, as well as on the UC Davis Olive Center website. Private tour at the Robert Mondavi Institute and the Wolfskill property for up to 20 people. A selection of our campus-grown products. 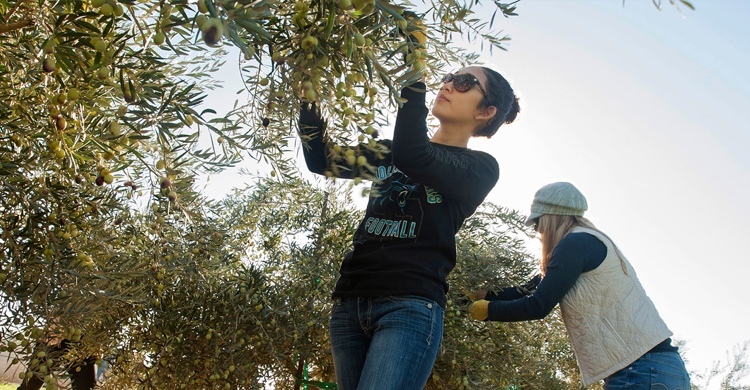 The Olive Center planted the first UC Davis olive orchards in more than 40 years. We use the orchards for research and for production of UC Davis Olive Oil. A sponsorship of $10,000 will allow us to pay the costs of maintaining the orchard for one year. Special recognition of sponsor on signage at the orchard. The Center relies on financial support from those who embrace our innovative and cost-effective efforts for olive growing and processing.